Very early fisherman's breakfast, light lunch, drinks and seafood dinner: Marblehead has 'em all. Washington Street in the center of Marblehead Old Town has several small cafe-restaurants good for a filling breakfast or light lunch. Several also serve dinner. The Driftwood Restaurant (tel 781-631-1145), 63 Front St at the State Street landing, is right out of a storybook about hearty New England fishermen and boatbuilders. Breakfast, clam chowder, sandwiches, and fish or seafood plates are the hot items here. Its barn-red clapboard exterior is matched inside with red tables and a lunch counter. At 5:30 am, when it opens, the fishermen troop in for coffee, eggs, and ham, and for talk of the day's weather and prospects for the catch. Later in the day they may return for a bowl of chowder or, on weekends, a portion of fried dough—a Driftwood specialty —served with butter and maple syrup. It closes at 2 pm. Cash only, no credit cards. 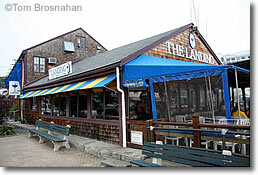 The Landing (tel 781-639-1266), 81 Front Street at the landing, is the largest and most elaborate of Marblehead's Old Town waterside restaurants. It caters to the boating crowd which includes early-morning amateur scallop and lobster hunters. Here you'll find an English-style pub and dining rooms with a view of yacht-filled Marblehead Harbor. Come for a simple lunch of fish and chips, or something fancier at either lunch or dinner. The Landing's Pub section, popular with the younger boating set, offers burgers and beer.